Of all the Tom Daniel Designs only about 5 are my true favorites. One of them was the Trantula. 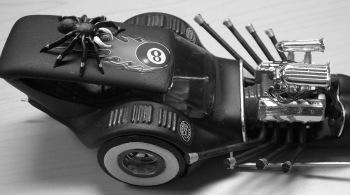 The Trantula combined two of my automotive passions 1960s rails and Ford Power! 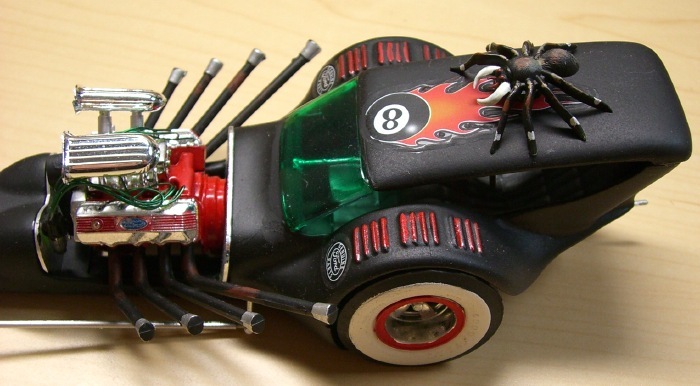 For Christmas 2003, I received a mint unbuilt Trantula for a gift. My goal was to capture as true to form as I could what made this rail so cool. While reading Tom Daniel's comments about the car he stated he built one in orange. So I thought it would be cool after all he designed it right? Well after laying down the orange paint it ran in several spots and the green showed through. I stripped it and thought well I will go back to the original green color. A friend had just painted a dune buggy in a flip-flop green and when I saw his buggy I thought that would be perfect for the Trantula. Well misfortune struck again--the primer I used as well as the base reacted to the paint or the stripper I used and thus it lifted all over the car showing the gray primer underneath. Angered at the fact that I botched two paint jobs as well as ruined a Trantula I gave the decals to a friend and boxed the kit. 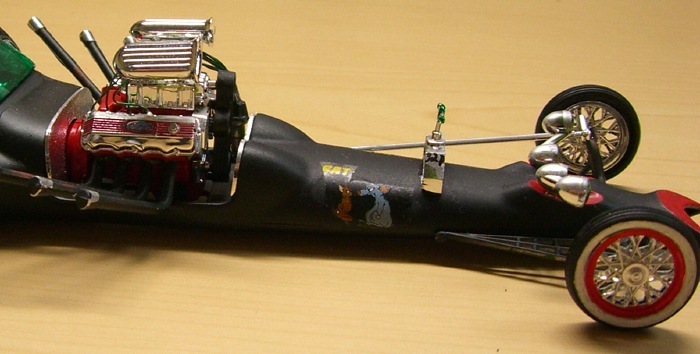 Well some time passed and I saw where Tom had done a few of his designs as "rat rods." The Wheels started turning and I saw that the Trantula had not been done. So out came the box and after a little sand work to get the cracks out. It was then hit with a 99 cents can of good old Wal Mart flat black spray bomb. The body was damaged because of all the previous stripping sanding and painting. It looks realistic like a lot of poor body work has been done. Since Mr. Daniel made it clear that the Trantula was fiberglass I could not rust the body. I next did the tires in white wall style front and rear and trimmed the wheels in red. It really sets of the black well. The motor was done box-stock but with a LOT LESS chrome and little dirt. 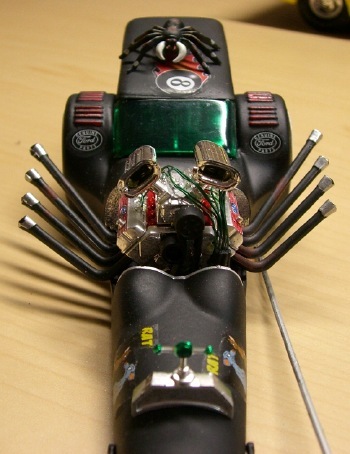 Radio Shack Wire was used for plug wires and left green because I liked the look of it. The interior was done in various grays and weathered to get that well used look. Final touches are Tamiya transparent green on the windows and "eyes" as well as a swap meet price on the radiator shell. Some extra decals were applied to finish it off. Overall I am happy with the way it turned out. From the rusty headers and front axle to the car guy touches the "Ratula" looks like a real grass roots showrod. 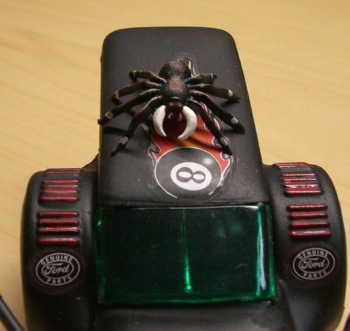 And with "Spike" the tarantula guarding it has a pretty safe car alarm. I hope to do a box stock very soon but for now I at least have the "Ratula".